getcalc.com's Ε - Young's Modulus Calculator is an online mechanical engineering tool for material analysis to measure the elasticity (ratio of stress (σ) & strain (ε)) of material, in both US customary & metric (SI) units. 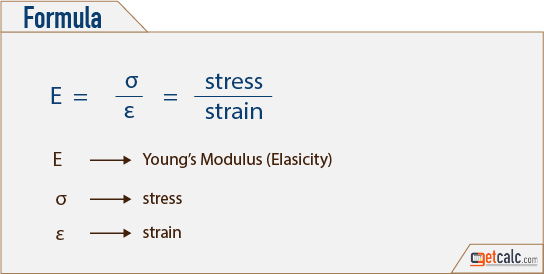 Young's Modulus, often represented by the Greek symbol Ε, also known as elasticity modulus, is a physical quantity to express the elasticity (ratio of stress & strain) of material. It's an one of a most important functions in strength of materials, frequently used to analyse the stiffness of a solid material.